From LAIKA, the Academy Award nominated studio behind Coraline, ParaNorman, and The Boxtrolls, comes a new adventure set in a mythical ancient Japan. In Kubo and the Two Strings, scruffy, kind-hearted Kubo cares devotedly for his mother while eking out a humble living in their sleepy shoreside village. But when a spirit from the past appears, Kubo suddenly finds himself entwined in a violent struggle against gods and monsters. 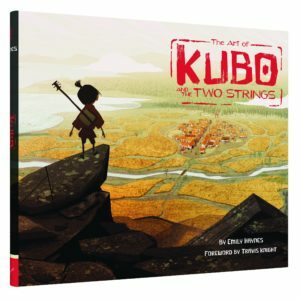 This fully illustrated book offers a behind-the-scenes view of the amazingly detailed artwork and unique stop-motion animation style involved in the film’s creation. To celebrate the publication of this beautiful hardback book by Abrams & Chronicle, we’ve got a copy to giveaway to one lucky winner! For a chance to win, enter by via our competition app below! The competition ends at 23:59 on 15 September 2016. The prize consists of a The Art of Kubo and the Two Strings book. Win an action Blu-ray bundle to celebrate the release of SURVIVOR!